We eat a lot of salad in the summer months: sometimes twice a day. Usually we will grill a bit of chicken or fish and have that as our protein source, but often I crave something a bit out of the ordinary. Enter goat cheese cakes! I first discovered them when I was taking a cooking class at The Dirty Apron, in Vancouver. Since then I have made them several times and a few days ago, I just had to have some. This time I changed the recipe up a bit, by adding some fresh rosemary and I was thrilled by the flavour. This recipe is really flexible as you could substitute any dried fruit for the apricots: I’m thinking dried cranberries, or peaches would be magic as well. My suggestion is that you eat the cakes as soon as you make them. The flavours and texture are perfection when they are warm. Once they have been refrigerated, they tend to be more chewy than crunchy and some of the flavour is lost. You don’t have to add the rosemary; you could substitute another herb for it. I am bringing a heaping plate of these savory delights over to Angie’s Fiesta Friday tonight. This is one crazy virtual party that has been going strong for 27 Fridays now! Thanks to Angie of The Novice Gardener, our host extraordinaire, we get to mingle and share our latest and greatest recipes, photos, music and any other passions we have, with our blogging buddies. Tonight our soirée is being co-hosted by the very lovely and talented Prudy @ Butter, Basil and Breadcrumbs and Jes @ Cooking is my Sport. If you haven’t already, be sure to check out both of the sites of these wonderful bloggers! You will be so happy you did. In a bowl, combine the goat cheese, apricots, Parmesan cheese and chives and rosemary. Season with a bit of salt and freshly ground black pepper. Divide the mixture into 6 portions and roll each one into a ball. Using your hands, form each ball into a disc shape about ½ inch high. Prepare to dredge the discs by placing 3 bowls side by side. In the first bowl, place the flour. In the second bowl, whisk the egg. In the third bowl, add the panko crumbs and a bit of salt and pepper. Dredge the discs first in the flour, then dip into the egg, and finely coat with the panko crumbs. Serve immediately with a salad and a crisp, cold glass of French rosé. Sigh, because this is what summer is all about! Bet you can’t take just one bite! It looks sooo wonderful!great clicks! Julianna, these cakes look so delicious! 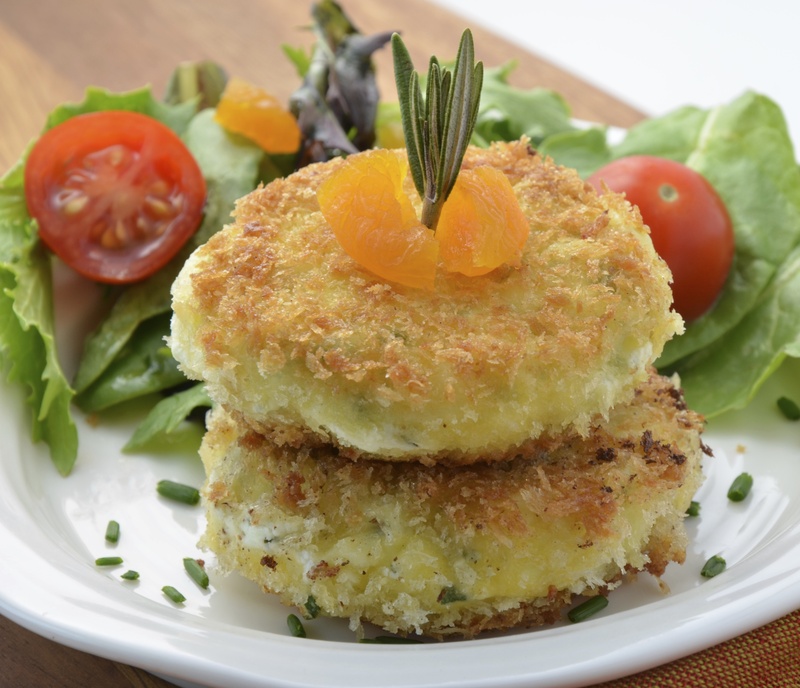 I would never have thought to combine apricot with rosemary and goat cheese! You rock Julianna!!! These are amazing!!! Thanks Lori! Hey, aren’t you on vacation? Did you take your computer?? Things haven’t quite turned out the way we planned. Hubby got really sick and then we have had some hard family news to deal with. Oh wow, these look and sound amazing ! Sounds PERFECT. These look so appetizing Chef! Livd the recipe!! Julianna they look a perfect delight. ….love all the ingredients in there. …..just enjoying the look of it…..hmmmm just yuuuuuum. 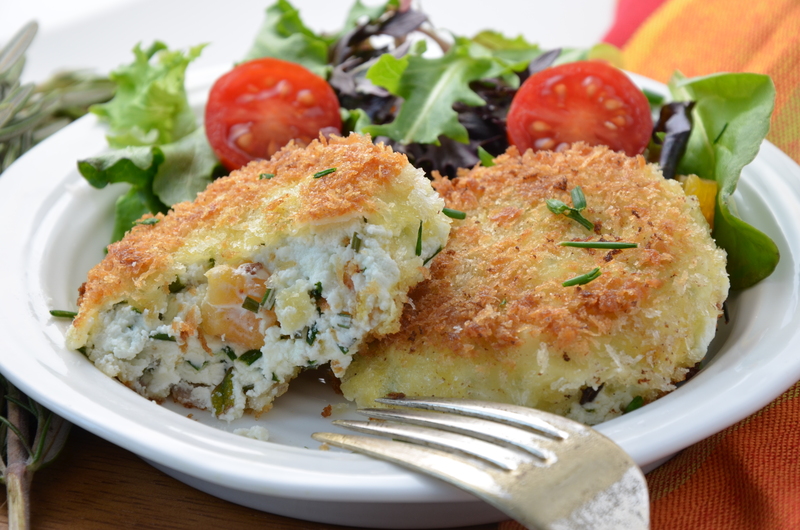 ..
Oh my do those look delicious, this reminded me I need panko and I think I need to make these. wow, these looks delicious! Pinned! Such a nice flavors! Well, so glad you think so! Well, I don’t know, Ahila…sweet cheesecake is pretty delicious too! Good luck with choosing 😉 You have a wonderful weekend too! Happy Happy Fiesta Friday Julianna!! Someday I hope to have your culinary skills and creativity. 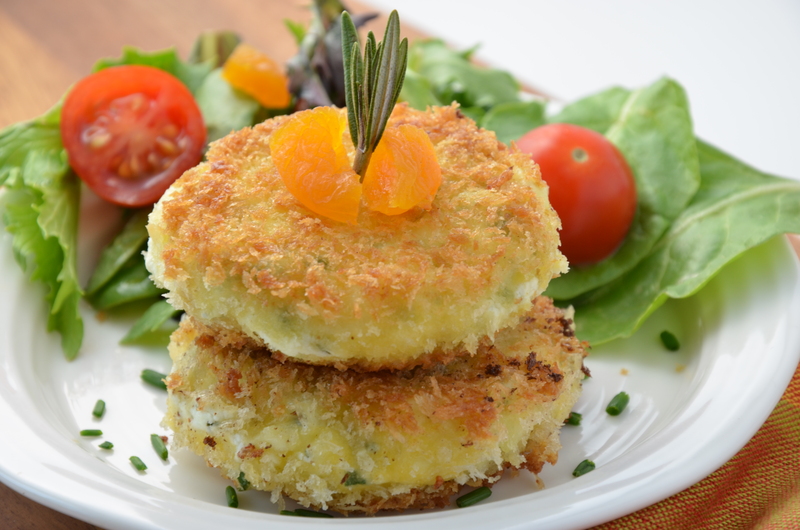 Seriously… these goat cheese cakes look so fabulous.. I’m loving the idea of the tang of the goat cheese, with the sweet dried apricots… with chives and rosemary? Oh yeah… LOVE. I’m so glad you brought these to the table tonight…. thank you for sharing! ❤ Awesome, awesome post… gorgeous photos… wonderful recipe..
Oh Prudy, you are just too humble! I keep looking at you and hoping one day I will reach your level of creativity! Aren’t we funny? Anyway, thanks so much for the lovely comment and thanks too for being such an awesome co-host. You are so kind, welcoming and enthusiastic and I just know that you inspire so many of us! ❤ Have a wonderful weekend! Julianna this is such a lovely summer meal – perfect with a salad on the side! Julianna, If I could I would eat these cheese cakes everyday 🙂 I will definitely bookmark this! This looks so good! You are right, I can’t just take one bite! Happy FF! Haha! I couldn’t stop nibbling on them when I was trying to take the photos! They fragrance of them was a complete distraction 😀 Happy FF to you too! Wow! Who’d have thought???? What a beautiful blend of ingredients for this savory delight. Bravo! I’m arriving a little late and empty handed, but delighted to find these tasty, savoury cheese cakes. Once I have made my rounds at FF, I hope to get back to my own blog. Btw, it’s a beautiful little boy! 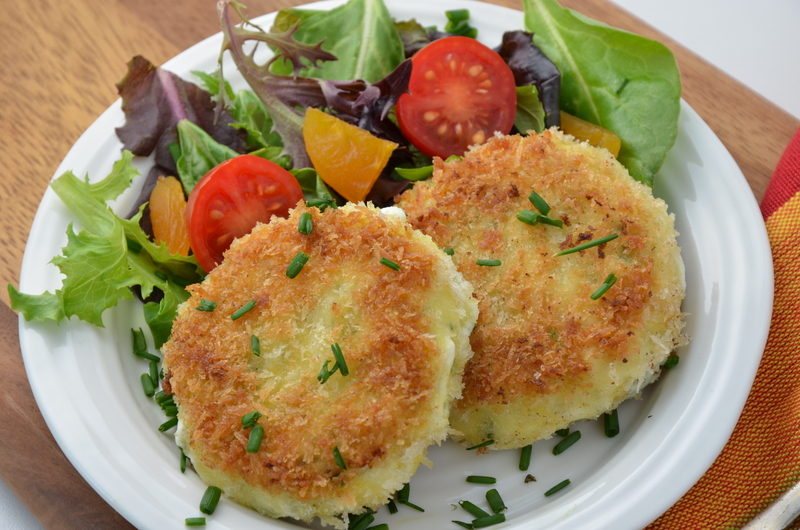 On another note, I know you will LOVE these goat cheese cakes – eat them as soon as you take them out of the pan. They are really awesome! Hey, welcome back, Kloe! I’m so glad that you like the new header! Are you going to Fiesta Fridays? These look hard to resist! Would they be as good with ricotta? Hi there! So glad you like the look of them! I think ricotta might be a bit too moist for this recipe. They need to be able to withstand the frying process without falling apart. Maybe you could test it out with a scaled down recipe and let me know… 🙂 Good luck!